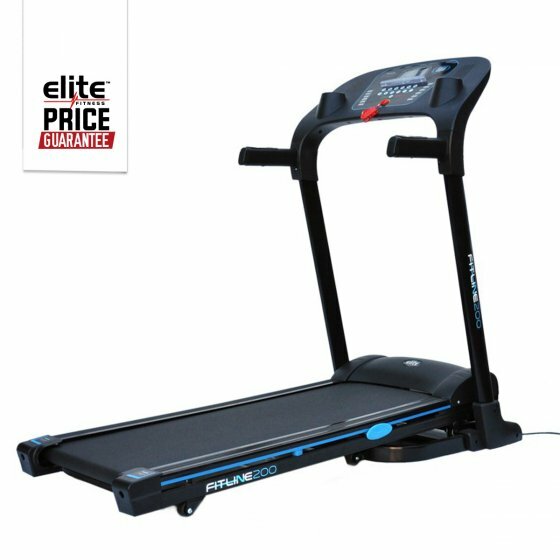 New to the Elite Range, the Elite Fitline 200 is a straight-forward, stylish treadmill. It features an Easy to Read LCD Console that provides constructive feedback on Speed, Incline, Distance, Time, Heart Rate and Calories burned. Automatic Quick Incline and Quick Speed buttons allow you to change the motion of your workout in an instant. Select from the 12 Built-in Workout Programs to keep on track and stay motivated or to enjoy some variation in your routine. Fitline 200 also comes equipped with built-in speakers and a Compatible Music Port for iPod®, simply plug in and let the music flow! With a 1.5 HP Motor and Shock Resistant cushioning, the Fitline 200 Treadmill is ideal for walking. The folding design of this treadmill and transportation wheels allow it to be easily stored, taking up minimal living space in your home. 15 Levels of Automatic Incline Training: To get your heart rate up and burn more calories faster.